Asheville, NC — U.S. Forest Service Southern Research Station (SRS) scientists co-authored the article in the journal Genome Biology that reports the sequencing, assembly, and annotation of the loblolly pine (Pinus taeda) genome. As the primary source of pulpwood and saw timber for the U.S. forest industry, loblolly pine is of great economic importance to the South and the nation. David Neale, professor of plant sciences at the University of California, Davis, led the loblolly pine genome project. As part of the project, researchers identified a candidate for a gene involved in resistance to fusiform rust, a disease that infects southern pines. SIFG biological science technician Katherine Smith worked with John M. Davis, professor and associate director of the School of Forest Resources and Conservation at the University of Florida (UF), to compare mapped sections of the genome with sections found in loblolly specimens previously inoculated with the pathogen that causes fusiform rust. 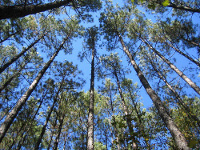 SIFG involvement in sequencing the loblolly genome actually goes back at least two decades, when SIFG helped develop an array of resources to help speed up mapping and sequencing the loblolly pine genome and provide the ability to identify genes that influence factors such as tree growth, wood quality, stress tolerance and resistance to disease. SIFG also conserved and supplied the plant tissue used in the genome sequencing project and provided quality control on the DNA samples that were sequenced. The loblolly genome project was led by a team at the University of California, Davis, and the assembly stages were led by Johns Hopkins University and the University of Maryland. Other collaborating institutions include Indiana University, Bloomington; Texas A&M University; Children’s Hospital Oakland Research Institute and Washington State University. The research was supported in part by the USDA National Institute of Food and Agriculture through its flagship competitive grants program, the Agriculture and Food Research Initiative.